Sweet Lemonade Photography, capturing life's sweetest moments in central Illinois and beyond. Located in Mahomet, Illinois, Sweet Lemonade Photography photographs in Champaign and surrounding counties frequently and also travels nationwide and internationally for weddings and destination senior sessions. If I was raising a girl, I would want to surround her with role models like Mahomet-Seymour High School PE coach Mrs. Allen. Shoot, I want my boys to be influenced by her. Kristin Allen and I worked together last year when I photographed the girls cross country team incorporating the slogan Strong is Beautiful and are collaborating on some other projects now. I will never forget what she told me last year when I complained about being overweight. She stopped me and said, "No you are not overweight. You are under strong." Mentally that change in wording makes a huge difference. I love it. Yes, I just need to get stronger. Weight really isn't the main issue... it's how the weight is comprised of our bodies that determine our health. Would I rather be 175 pounds strong and full of muscle or 175 pounds of flab that shook more when I ran than a washing machine that is out of balance? l know what I'd prefer. Girls, do not be afraid to lift. Don't be afraid to lift HEAVY! You will NOT bulk up. But you will build the most amazing muscles that will help you swing the bat faster, jump higher, and run quicker. Get out of your comfort zone and develop more strength. 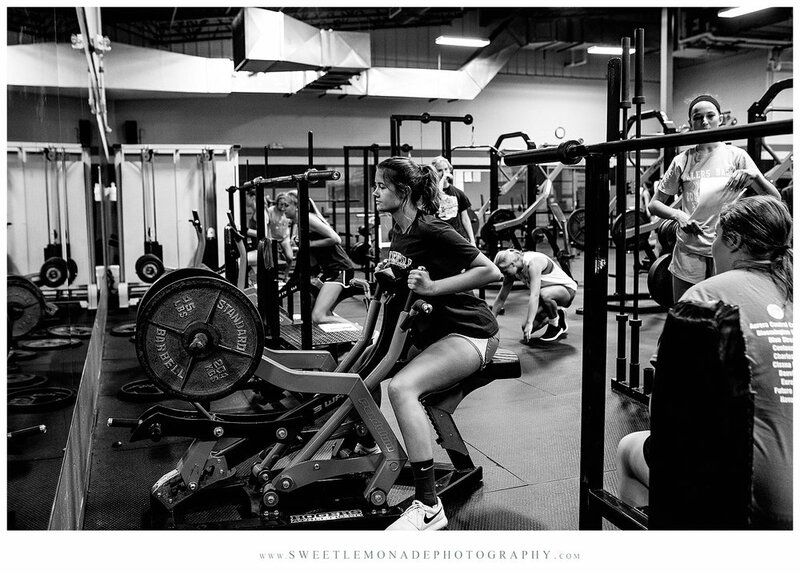 This summer, all the female high school athletes are lifting together. This concept of all female athletes training together was the brainchild of coaches Stacy Buzicky and Nathan Seal. Stacy shared with me the challenge in the summer for multi-sport athletes to lift with every team they are involved with. Not only is there a potential for injury if they do not allow time for their body to rest and muscles to recover, it was difficult for the kids to find much time to relax with friends or hang out with family. After she saw the exhaustion her own son experienced last year with that sort of regimen she set out to make sure that was changed. The girls have been lifting for about weeks and it's providing a new kind of camaraderie among the girls in all sports at MSHS and loving it. Kristin, who has extensive knowledge in lifting, is teaching them proper form (and Stacy and Nathan are ensuring the girls are doing things correctly too) but more importantly, she is teaching them to have confidence in themselves, pride in what they do, and motivating them to be a better version of themselves than they were yesterday. The way she speaks, lives, and motivates is incredible. I walk away from every interaction with her inspired. So, who's joining me at the gym? To read more about Kristin and the summer lifting program, you can view the article that was in the Mahomet Citiizen last month.